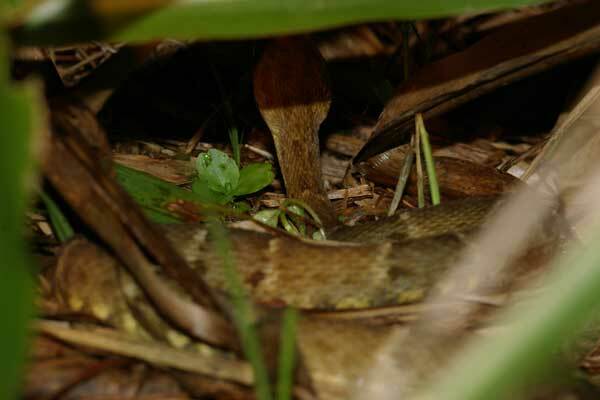 This is another in the ever-growing set of candidates for "Worst photo on wildherps.com". Other proud entries in the competition include the awful "Boomslang Speeding Up Tree in Dark Forest", the dreadful "Distant Nile Monitor Taken with 400mm Lens on Slow Slide Film While Standing in an Idling Jeep", and the really just pathetic "Poorly-flashed Fragment of Collared Whipsnake Hiding in Log". 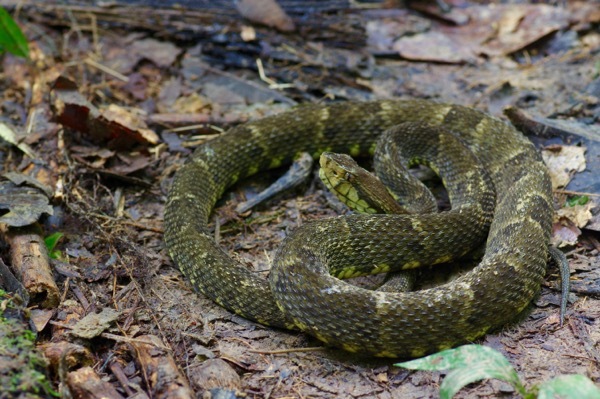 My excuse this time was that this dangerously venomous snake was partly concealed at night and ready to slither off at the slightest provocation, and our guides made sure I didn't get too close. And it was quickly slightly provoked, and slithered off. A decade and multiple trips to South America later, I finally got decent photos of this common species. 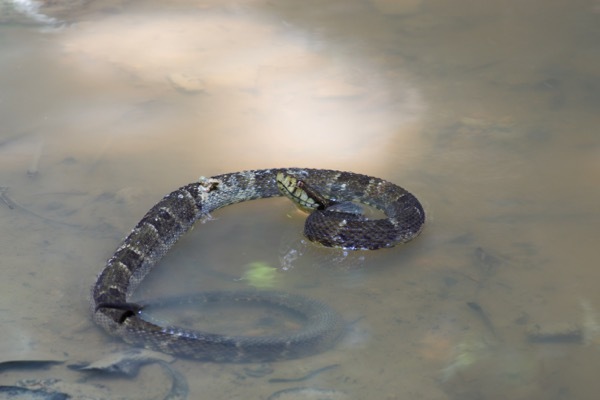 This one was seen moving on the shore of a rainforest stream by Kevin Urbanek, who followed it into said stream, then splashingly chased it down the stream under the mistaken impression that it was a harmless water snake. Fortunately those of us on the shore shouting at him instilled enough doubt that he made a last-second decision not to grab it barehanded. Matt Cage eventually captured it with tongs and got it to settle down, first in the water, and then on a forest trail.